A few Sundays ago Kerrie D. and I took a workshop in working with resin. It was at Pratt Fine Arts Center here in Seattle and it was taught by Anne Randall ( a very knowledgeable and oh so very excellent instructor). Tin has it's limitations and I have pretty much been a purest in that regard, working only with the metals I can find. Now the resin will allow me to add elements I can't find in tin and will expand the visual impact of my work when it's incorporated. ...until real flowers come out. It's lightly snowing here today, I can hardly wait for Spring. This will be a fun tin piece one of these days. Having a job as a driver seems to influence my artwork at times. 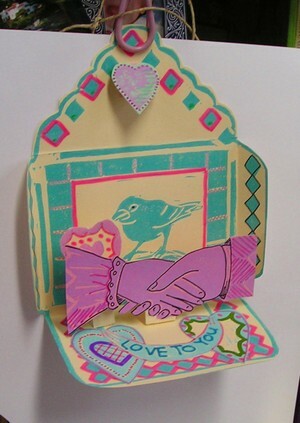 Now is the time to start making Valentines. There are so many different ways to make them. This one is from a few years ago when I was into block printing and then jazzing it up with felt pens. This year I'm thinking it would be fun just to alter cards from thrift stores with rubber stamps, stickers and drawing, maybe even a little paint too. What will you use to make your Valentines? They are evolving. Getting better little by little. The trinkets are getting better and more plentiful as new sources are uncovered. The inner shells are stronger and bigger. The wrapping of the crepe paper is even getting tighter and better looking. The only problem will be keeping it up, keeping it fresh and interesting so it continues to be a worth while endeavor.Keeping the lady bugs on task can be a problem too. The San Francisco Cost Plus sold surprise balls in the 1960's. As a treat my mother would buy me one and I could hardly wait to get in the car and start in unraveling it. Small trinkets would fall into my lap as the colorful crepe paper unfurled. Little treasures. These are my version I was making for awhile. Playing with those water crayons, for me, is just one of the best ways to have fun. Click on image to enlarge. 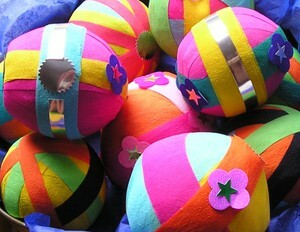 I made a few of these dexterity BB toys as Christmas gifts and they were a huge hit.